Compared to traditional ads, the clutter of social media, and other channels you have little control over, email marketing remains king. Email continues to be the most personalized and effective channel to build relationships with leads and customers – not to mention it is a champion of ROI. In order to reap the full benefits email has to offer, you must start with a strong foundation. Your email marketing efforts will be fruitless without a quality, engaged email list. So just how, exactly, do you build your email list the right way? In this guide you'll discover all the right reasons and methods to carefully curate an email list, along with the tools you can use to grow your list quickly and easily. Email has become an increasingly regular part of day-to-day communication and digital consumption over the past 20 years. And despite claims that “email is dying", email marketing is having its second coming of age– email is not going anywhere, and there are new strategies and practices in play to amplify your email marketing efforts. As an ecommerce marketer, you’re already familiar with the New Email. Build for mobile. Keep it short, since emails are only browsed. But all the best practices in the world will do you no good if they fall upon deaf ears – er, inboxes. The key to a successful email marketing strategy comes before you ever even send an email. Without a quality database of emails, there is no point to an email marketing strategy. And just as all aspects of email have adapted, how you grow and maintain your email list is overdue for an update. So we’re taking it back to the fundamentals, because who you email should be the foundation of your efforts. The fact is, even in 2017, the value of email continues to climb, and if you think email is a dead end for communication and conversion, it’s because you don’t have a strong list of engaged subscribers. What exactly is the definition of a thriving email list? Think about your gym routine. It takes a little time, patience, nurturing to get fit and healthy. It’s not just hitting the gym once, but consistently growing fitter each time you go to the gym, eat healthier, or catch up on those extra zzz’s. Your email strategy is similar; it requires growth and nurturing. A strong email list must be built from high-intent subscribers who are genuinely interested in your business and have opted-in to your communications. When your database is made up of the right subscribers (leads, customers, and interested subscribers who want to hear more about your brand), email communications will be worth your time and marketing efforts. Just like the gym, there is no quick and easy fix to get to the desired endpoint. But – it’s really not as difficult as you think. 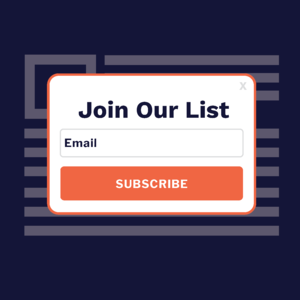 In fact, growing your email list can be the easiest part of this equation, and there are simple steps you can take after building the list, to maximize the return on your email marketing efforts. In this guide, we are going to detail exactly how you can use free and low cost tools to grow and maintain an email list that will continually prove to be your highest Marketing ROI (ROMI) and most valuable marketing asset. Before we get into growing your email list, it’s important to understand why you should care about email as a channel. Why is curating an engaged database of email addresses worth your effort? First and foremost, when a consumer grants you their email address, they are offering explicit permission to enter their inbox – an inbox that most consumers check every day. And about that every day thing: 98.4% of consumers check email at least once every day, with 60% of consumers checking email more than 3 times per day (Business Insider). Certain channels, such as social and SEO, might seem to be a more worthy fit in ecommerce marketing - but despite the potential, email is still winning. The ROI of email marketing is 4300%, which is double the ROI of any other digital channel. And if you think about it, it makes sense. Social media, PPC, and display ads promise to attract potential customers. But what are two common denominators shared amongst these channels? 1. Unlike email, you don’t ultimately own the direct relationship with that consumer. Google, Facebook, Instagram, or Snapchat control the algorithms and methods for reaching that audience. 2. You have to pay to reach these people, time and time again. Email is a more direct relationship with your potential customer than ads or social media. As Campaign Monitor explains, 90% of email is successfully delivered, whereas only 2% of your Facebook fans will see your posts in their feed. Facebook ultimately owns this direct relationship with the user you are trying to reach on their platform. Unlike reaching consumers through social media, email allows you to personally own the relationship and direct line of communication with your subscriber. But simply sending emails to any addresses you own isn’t enough; for an email list to be of high value in your marketing strategy, you need to focus on converting high intent subscribers. (Hint – the best subscribers absolutely do not come from purchased, or rented lists). The reason some consider email to be on the out is due to the outdated means of spammy mass emailing and buying subscriber lists. Not only do both of those practices reflect poorly on your business, they also just don’t work. Time and time again we see lists that were grown organically through legal, proactive opt-in methods lead to higher engagement and conversion rates when compared to acquired or purchased lists. Engaged subscribers sign up because they were interested in what the brand had to offer in the first place; therefore, they are much more likely to convert into customers. That alone should be more than enough of a reason for you to take list growth into your own hands, but just in case you needed any other reason to avoid purchasing email lists, here’s a reminder that you can inadvertently get into a lot of trouble for doing so. ESPs can block your business for receiving too many abuse and spam complaints, and it does not look good for you. As a means of protecting themselves from CAN-SPAM laws, an ESP may not even let you use a purchased list to begin with. More ESPs are growing in favor of a double opt-in process, just to be super certain a subscriber is giving you permission to email them. When you consider the return earned by marketing to a healthy list of subscribers, it just doesn’t make sense to put your marketing dollars into purchasing a list. There are a few more brief reasons to continually grow your email list, aside from the unprecedented ROI. One reason being, lists shrink. Year over year you will lose about 30% of your list – and that’s not a bad thing. Remember, you want the best quality emails on your list, and you definitely don’t want to pay your ESP for more emails than are returning value to you. Possibly the most remarkable reason to grow your email list from the ‘right’ subscribers is the subsequent subscriber data you can gather to fully understand your consumer base, develop a unique, personalized relationship with them, and convert leads into paying customers. You can take unknown shoppers, and really get to know them, all because they gave you their email address. A list of subscribers who have opted-in to receive communication from your business opens a world of opportunity. Before they sign up, this viewer on your site is completely unknown to you. You know little about them – you may be able to capture some general information from analytics, but nothing truly specific about the shopper’s habits. Once you begin sending communications to subscribers, you’ll be able to uncover their interests by seeing what they click on in emails, where they browse on your site, and which items they purchase. Capturing a lead takes them into the ‘known’ territory, enabling you to target them with specific communications of interest to them, and convert them into a paid subscriber or shopper. As a marketer, if you never get them to sign up, you may lose the chance to ever direct the lead down this funnel, and the chance to further educate them about your brand or products. Okay so, the key to email marketing is curating an engaged email list, but how, exactly, do you build one? There are 3 main components to growing a strong email list. The initial step is driving traffic, which will ultimately be converted into an email list. The second step is identifying how to best convert said traffic, targeting and nudging the ‘right’ subscribers to sign up using tools like popups, banners or landing pages. Finally, a succinct follow up strategy is the third step that will keep your list happy and engaged with your brand. In order to drive visitors who come to your site to join your email list, you must of course get them there in the first place. There are a variety of methods to drive traffic, and some may work better to reach your target customers based on their demographics and your industry. By pulling traffic from relevant sources and channels, you’ll maximize traffic that will be most interested in sticking around on your site. There’s no sense in gaining millions of site hits if those viewers aren’t potentially interested in what your business has to offer. This can be challenging, but important legwork for all aspects of your online business. One way to attract viewers to your site is by becoming a knowledge base for your niche in your industry. Through blogging and inbound marketing in general, you can present yourself as an expert stakeholder in your specific business. By publishing factual, informative blogs and resources that answers questions for your prospective customers, you’ll increase the likelihood of the right people seeking out your site - so when your prospective leads are searching for a solution to a question or comparing products and find the answer on your site, you’ve just generated relevant traffic. Allocating your ad spending to targeted Google AdWords and Facebook Ad campaigns can also help drive relevant click-throughs to your site. Experiment with different ads to see which resonate with shoppers most, or which keyword variations lead the most traffic to your specific business. If fitting, you could make the most of free social media opportunities, such as influencer marketing, posting shareable content, and proactively engaging with followers or users. Additionally, partnering with relevant, reputable companies for contests, posts, or mentions can increase your credibility and, if they link to your site, add another channel for visitor flow. No matter which of these methods you try, it will take time and experimentation to get traffic numbers up. And keep in mind, as traffic grows, 98% of visitors will leave before completing a purchase. Therefore, personalizing the experience for this unknown traffic when they arrive will help drive sign ups, converting unknown viewers into known subscribers. IF they don't complete a purchase on their first visit, this will give you a chance to nurture these leads back to the site and close a sale down the line. The most effective methods to convert traffic and collect emails from your ecommerce site are through popups, bars, and banners, which give your visitors quick and easy opportunities to opt-in to your list. The most common display type that comes to mind for email collection is the popup - a word that may make you cringe when you first hear it. Keep in mind, there’s a reason they are so popular; they work. But when you’re thinking about growing your list, a popup is not the only tool you have at your disposal. If popups scare you, try using banners, a more subtle email bar, or even some really well placed embedded forms or flyouts. Before you completely rule-out the popup, let’s take a deeper look at each of these options. Don’t knock it til you try it. A popup may be a surprising pause in navigating your website, but they are incredibly effective and make it easy for subscribers to join your list without having to look around for a subscription form. Plus, you’ll capture interested shoppers who wouldn’t otherwise have considered joining your email list without being prompted to do so. Pairing a popup with clever verbiage or a specific campaign, like a discount, might be more than enough to gather that email address. Guitar capo and pick brand Thalia Capos has made excellent use of a popup display. Does the popup seem intrusive or annoying? Hardly – and even less so when you realize Thalia Capos has chosen to offer a 10% off reward just for signing up. Importantly, customers have the option to easily opt-out and keep shopping. But as far as implementing this popup in regards to the marketing opportunity for traffic landing on ThaliaCapos.com, the brand has collected nearly 10,000 new subscribers in the past 5 months alone and has a 4% sign up rate compared to site traffic, so it has been well-worth implementing. If you want a more subtle email collection form, a bar sitting at the top or bottom of the page may do the trick. Plus, these stick around longer than a popup, which can be quickly closed down. With attention-grabbing movement, a banner offers a different approach to a traditional popup. Taking up only part of the page, it’s less invasive than a popup, but harder to ignore than its smaller counterpart, the bar. Another gentle nudge comes in the form of a flyout. Placed in the bottom right or left of the page, a flyout is particularly great for viewers who are in the middle of reading a long-form page, like in the blog section of your site. If they like what they’re reading, a well-timed flyout letting them know they can subscribe for more blogs or related topics is a perfect opportunity to capture their email. When we think embedded, we think evergreen. 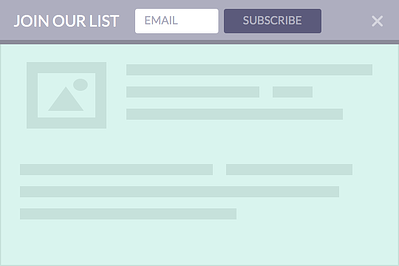 An embedded form makes for an excellent permanent installation in your footer or sidebar. This is a great backup for viewers who clicked out of a popup, or if you want the most subtle alternative if you find that bars or banners aren’t working for you. A simple solution would be to add an embedded sign up form in the footer of your site; if viewers are looking around your site and investigating other footer links, it’s likely they are interested in learning more about your business. Let the subscribers know how frequently they will receive communications from you to set clear expectations, and to increase the chance you will acquire only the most engaged subscribers. Not all devices are browsed equally. Just as you design emails for both desktop and mobile, personalizing the on-site experience for viewers based on their device type will go a long way in growing your list. For example, Project Repat uses a popup on their desktop homepage, but sees nearly equal success by using a bar on the mobile version of their homepage. The bar on mobile uses a call-to-action text, letting the viewer know they could save an additional 15% off, whereas on desktop, both the offer and email field are visible. A bar at the bottom of a mobile page is in the natural scroll path mobile users are used to, so a simple tap is all it takes for a user to look into the email signup further, should they be interested. By targeting devices with different display formats, you can craft a more fitting experience, trigger different offers and opt-in experiences that work for each visitor based on their screen size. A campaign is the messaging behind your display, which helps convert traffic by letting viewers know what they are getting for signing up. Your campaign type should cater to both your audience and your brand. It’s important to note that regardless of your display, the key to a successful campaign is clearly identifying what subscribers will receive for signing up. It sets the expectation for those who sign up. Will you be sending recipes? Blog posts? Deals and promotions? Let potential subscribers know. 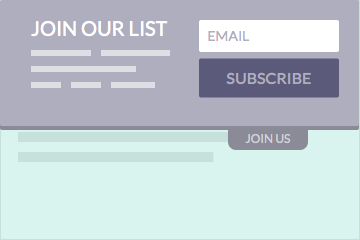 For some ecommerce sites, a simple ‘join our email list’ form in the footer of a website (with concise, clearly defined benefits!) may be sufficient. For other businesses, a really effective campaign explicitly calls out a specific offer or incentive in the campaign messaging. An exclusive email-only discount, or a percentage off first purchase may convince an interested visitor to sign-up. Other campaign types may be an email-gated offer, such as downloading an e-book in exchange for the subscriber’s email. The reason and reward is clear to a subscriber, and therefore is an easy way to amplify list growth when you’re offering something of value to fuel conversion. Mission driven apparel brand, Ivory Ella, has added over 300,000 new subscribers (converting 10% of traffic) by offering 10% off a subscriber’s first purchase. Interested first time visitors are willing to share their information in exchange for something of value to them. Just be sure to send the offer immediately after the subscriber opts-in; it’s what they are expecting. Finally, there is a case for enter-to-win campaigns as well. The higher the incentive, the more likely a subscriber will opt-in. Just keep in mind that this may draw less engaged leads. 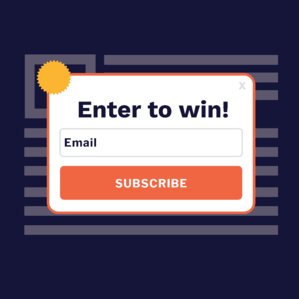 You can set up a simple enter-to-win campaign with a landing page, and be sure to let entrants know they will receive emails from you as a result of entering. Those subscribers could turn around and unsubscribe if they don’t recall opting-in in the first place. Identifying a campaign that resonates with your target consumers is key. Among all of the different components, triggers, and targeting techniques that you have at your disposal, campaign type alone carries the largest impact on the conversion rate (Privy). How are you going to display your campaign? Is a timed popup when your visitors hit your site going to be the most likely way to get them to sign up, or do you want them to take a better look around first? Triggering your display at different times or locations on your site can make or break your list growth efforts, and should be tested and tailored to see what works best with your audience. Put yourself in your visitors’ shoes. If you were checking out your own site, when would you be most likely to want to receive an opt-in invitation? For ecommerce sites, a popular solution is to delay a popup just a few seconds. This allows viewers a moment to shop around or take in your homepage, while still quickly capturing the new, unknown visitor before they decide to leave. Alternatively, if a shopper is browsing around for awhile, you know they are interested in what you have to offer. Delaying a popup and saving it for only the most invested traffic could help you grow a list of highest-intent potential customers. If you’re a publisher, you may want to wait until a visitor starts reading your site, and give them a chance to get through a majority of a post before displaying a popup. Using effective text such as, ‘Like what you’re reading?’ and letting the viewer know that you’ll email them more content they are interested in, gives them motivation to sign up. Again, if a shopper is spending more time on your site, you can assume they are likely to be a better fit for your email communications. Instead of waiting 10-20 seconds to display a pop-up, you can more accurately target shoppers by showing an opt-in form after they have scrolled 25%, 75%, or even 100% of a specific page. On an ecommerce site, you could offer specific messaging to the shopper page on the catalog content of the page they are scrolling through. Or, if someone is checking out a pricing page or product details, this might be an opportune time to take advantage of the intent of this visitor. If they are interested in learning more about the product, why not offer them more information or a user-guide in exchange for their email address. This way, just in case they don’t complete their purchase today, you have still captured a highly valuable lead you can convert down the line. Scroll percentage is also an effective tool for B2B and publisher sites as well. If a viewer reaches the bottom of the page, it’s a good sign they are ready for more content from your brand, which you can be sure to deliver to them via email. If you're hoping to use an email collection technique that does not automatically trigger, a tab or button is your new best friend. Requiring an action from your viewers, a tab or button that clicks open to display an email collection form is actually the highest converting trigger for email collection. Picture this: Your perfect customer comes to your site thanks to your well-executed viral post about new trends in motorcycle helmets. This particular customer is in need of a new helmet; she shops around, she even adds a few items to her cart. And then, her coworker comes into her office, she clicks out of the page, and never returns again. Farewell forever, potential customer. The thing about site traffic is, it’s literally worthless to you if it bounces. There is an incredibly high chance that someone who lands on your site may never return again – and it’s not necessarily your fault, the viewer may just forget. To capture their email address before they exit your site, you can implement an exit intent trigger, which tracks the mouse movement of the user and displays a campaign when they are intending to exit. You can use attention-grabbing or even snarky text here to grab the viewer's’ eye, or perhaps offer them a discount if you haven’t already, in a last ditch effort to grab their email. If you capture their email before they leave, you’ll be able to maintain the relationship with them instead of seeing them disappear back into the unknown. Of course, maybe there was another step you could have taken to make the shopping experience that much more personalized for the potential customer who was lead to your site through the helmet trends blog post. This is where audience targeting comes in. Now that you’ve chosen what type of campaign to run and you are exploring display types, let’s revisit that ‘unknown’ element of your marketing funnel. Changing the on-site experience for traffic based on the path it is flowing from is a great way to personalize the experience for visitors, which we’ve learned so far is key to converting the most relevant subscribers. For example, if you can tell a customer came to your site after searching the term “motorcycle passenger seat” and you sell everything from seats, to helmets, to mechanic supplies, why would you want to show them the deal you have running on tool kits instead of the promotion you have on a specific brand of seats? You don’t know much about these ‘unknown’ viewers, except for where they came from, so capitalizing on what you do know can make all the difference in growing your list and identifying compatible leads. There are other valuable bits of information you can identify from unknown visitors; how can they be used to your advantage as a marketer to change the experience for your site traffic? Geolocation: Where is this person? Source: Did they come from search terms in Google, Yelp or maybe from Facebook? Device type: Are they on a mobile phone, or a desktop? Landing page: Which page did they first visit today? Bounce page: Which page are they on when leaving your site? Visit number: Is this there first time on your site or 15th? Page number: How many pages have they viewed so far? Cart value: How much is their current shopping cart worth? Campaign signed up: Which of your previous opt-in campaigns has the visitor seen or registered for? Leverage these targeting variables to present a relevant opt-in based. If the visitor is a newcomer, you could show them your best selling items. If they are a repeat customer, chances are they already own your most popular item, so show them what’s new instead. Or, if you ship for free nationally, let local customers know, while serving a different shipping message to international viewers. But with great power comes great responsibility. Remember not to be too creepy with your targeting. In short, if you think through the 2-3 most common customer journeys on your site, can you come up with a matching offer or opt-in opportunity that is relevant for each one? That's where you should start. By this point, you’ve learned that the value of email marketing is founded in growing a high-quality base of high-intent subscribers. We’ve discussed different tactics to capture engaged visitors, turning your unknown traffic into known leads. And as a marketer, you may know there are a variety of simple solutions available to automate your initial communications with a newly captured email address. From the most basic series of welcome and introductory emails, to continually sending relevant email campaigns as the relationship develops, the personalization doesn’t end with your email capture. It is important now to remember that you worked hard to earn these emails, and the subscribers have trusted you enough to this point to share information with you. Don’t betray this trust! Email is how these contacts expect to hear from your brand, but they are more likely to unsubscribe if the communications they receive are not relevant to them, or if emails are too frequent. In fact, Hubspot tells us that 78% of consumers unsubscribe if they receive more emails than they want. Be sure to respect your subscribers - don’t make it difficult to unsubscribe. Also offer the option to choose the frequency of emails as an alternative to unsubscribing – and don’t be offended if people do still unsubscribe. You want a quality list of prospective customers and engaged users above all; that unsubscriber who isn’t interested in ever purchasing from you isn’t your loss, it simply helps you keep a more engaged subscriber base, and better tailor your content. Another reminder is to be sure to deliver what your subscribers are expecting, or you will lose these valuable contacts. It’s better to not email them at all than to force content or promotions at them that they don’t want or weren’t expecting. If your opt-in form declared you will send useful content and occasional deals, jamming daily flash sales into your subscribers’ inbox may turn them off. There are two ways to be sure you keep delivering what your subscribers want: ask them or investigate yourself. Just as personalization was important in collecting these emails, it is also important in continuing to engage your list. Sending a survey to your subscribers can help identify their interests and ensure you only send them what they’ll be excited to open. If you don’t want to send a survey, do the leg work yourself. Use the reporting tools in your ESP to see which emails they are opening, which links they click, and combine it with any relative customer data. Segment your email lists by interests or customer types and take the time to curate specific email campaigns to specific groups. It will improve your open rates, decrease list shrinkage, and keep your subscribers happier. From growing to maintaining, your email list is the roots of your email marketing strategy. It can be grown organically, nurtured and cleaned, and yet immediately damaged if you don’t continue to treat your list with the same emphasis on quality and personalization as you have since the beginning. But you will reap the benefits you sow, with higher engagement and conversions through these practices. If you’re just getting started with list growth, start simple. Choose a single campaign or display type, set it and forget it. Then come back to see what’s working, then try a few changes to see what else will engage your viewers and get more sign ups. Eventually you can start presenting more interesting, targeted and personalized forms that will really accelerate your efforts. We’ve made a downloadable sheet where you can track the success of each campaign type and combination you try. Use this guide to track which displays and calls to action really resonate with your viewers! You’ll be converting way more people from unknown, to known. Email continues to prove itself as a marketers most valuable asset, and in the face of the New Email, your email strategy’s success begins with your approach to list growth. Fortunately there are free and low cost tools you can use to capture traffic coming to your site. When you grow and maintain an engaged email list by personalizing the on-site experience for that unknown traffic, you can convert more visitors into known email subscribers. Ultimately, nurturing this curated, organically grown email list will transform your email marketing into your most successful channel for customer relationship growth, engagement, and revenue. So, identify the subscribers you want, choose a strategy that best suits your site, and start growing your email list! Our mission is to help our users grow their business and audience through a fundamentally strong email list. Privy integrates with dozens of storefronts and email service providers so marketers can build customer relationships and drive revenue. All tactics and techniques covered in this guide are available on the Privy suite of free and paid tools.